Visiting Dhyani House gives you two vacations in one. When you want privacy and views all to yourself, you can stay at the villa and hit the infinity pool, dine on the terrace, or take a shower in the home’s private gardens. Going to the beach requires no planning, just step outside your door! Then, when you’re ready for a little socializing, you can visit the main COMO Parrot Cay Resort for tennis, the fitness center, water sports, swimming, and shopping. The Shambhala Spa is open for massages, facials, Pilates, and Yoga. Cap it off with a trip to one of the resort’s two bars and restaurants. Whether you stay in or go out, you’ll love vacationing at COMO Parrot Cay. 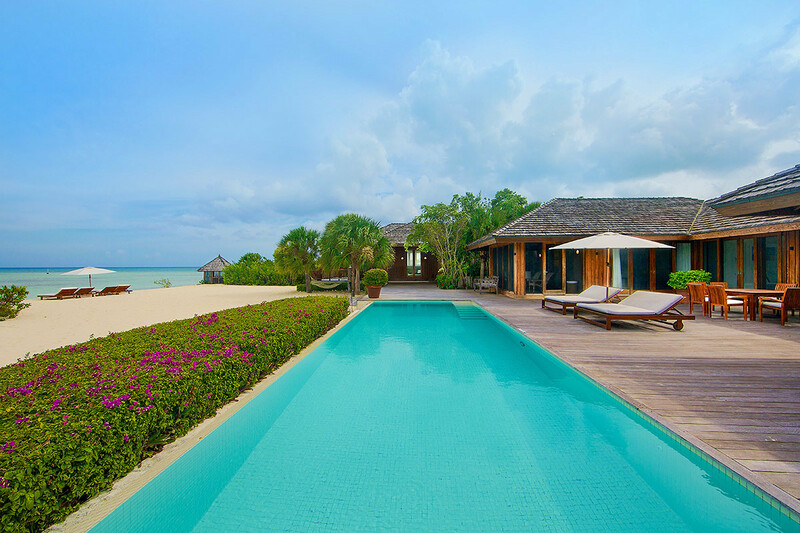 Dhyani House is a fully air-conditioned beachfront villa on COMO Parrot Cay, a private island in Turks and Caicos. The two-acre property is surrounded by thick gardens, perfect for couples who want privacy and tranquility. This vacation rental sits at the edge of a 60 ft beach, with a sand volleyball court, hammock, and a screened cabana. The 3,100 square-foot sundeck has an outdoor dining area and shaded daybeds for al fresco lounging. The deck surrounds the heated lap pool, which has a negative edge and intimate sea views. Framed sliding glass doors line Dhyani’s walls to eliminate any barrier between guests and the view. Cathedral ceilings and whitewashed interiors bring sunlight into each room. Watch movies on the flatscreen or read a novel in the warm living room after enjoying a snack at the dining table. Cooking is a breeze in the fully equipped kitchen, which sits behind the dining table. Relax in total privacy in the Master Suite detached from the Main House. The bedroom has a king-sized bed, ensuite bathroom, walk-in closet, and outdoor shower. The suite also has its own living room and screened lounge, and opens to a private deck. The second bedroom is next to the Main House’s common area, with a king-sized bed, ensuite bathroom, and an outdoor shower. This bedroom has access to the living room and the sundeck, with a screened lounge in between the suite and deck. The third bedroom is identical, and sits on the other side of the foyer. Dhyani House has daily housekeeping and butler service, as well as a 24-hour onsite manager. COMO Parrot Cay is designed to please any guest, with a tennis court, fitness center, library, water sports, nature trails, bicycles, and restaurants. Complimentary daily yoga and pilates takes place in the Shambhala Retreat center.